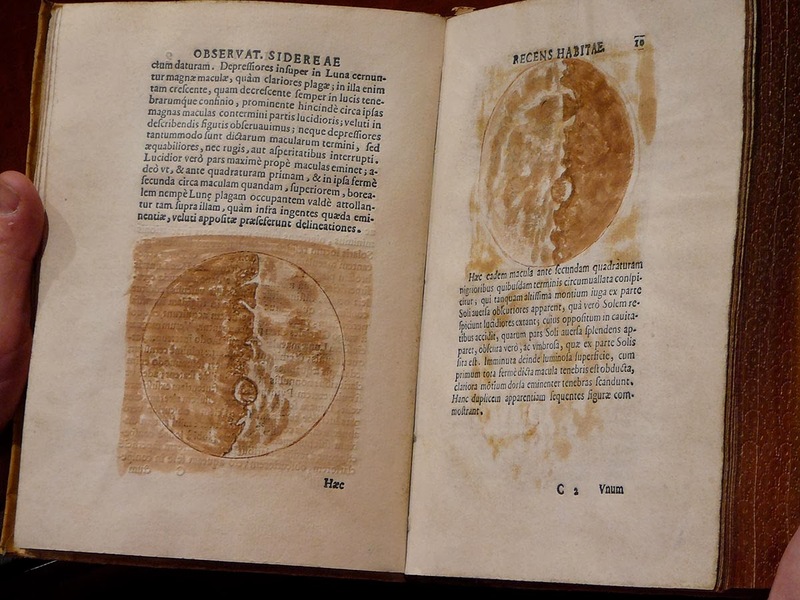 A couple of weeks ago, we published a post that featured Galileo’s Moon drawings, “the first realistic depictions of the moon in history.” As it turns out—some readers alerted us—some of the Moon illustrations attributed to Galileo are actually very convincing forgeries, so convincing, in fact that when the drawings surfaced in 2005, they initially swayed such experts as rare books dealer Richard Lan, Harvard professor of astronomy and history of science Owen Gingerich, and art historian Horst Bredekamp. All of these experts have since come to learn—partially through the investigations of Georgia State University historian Nick Wilding—that an unusual edition containing detailed watercolors, purportedly in Galileo’s own hand (above and below), was in fact created by forger, book thief, and former director of the State Library of Girolamini, Marino Massimo De Caro, who now stands accused of stealing thousands of volumes, including centuries-old editions of Aristotle, Descartes, Galileo and Machiavelli. The drawings we featured at the top of our previous post—from a set of five inkwashes made in 1609, called “the Florence Sheet”—are genuine, as are the etchings in the original text of Galileo’s scientific treatise, Sidereus Nuncius. However, as investigative reporter Nicholas Schmidle documented in a lengthy article published in last December’s New Yorker, the edition pictured above—purchased for half a million dollars by Richard Lan of rare booksellers Martayan Lan and once valued at over ten million dollars for its unique rust-colored illustrations—is a fake, despite being authenticated by a team of scholars in 2007. The story of how De Caro's forgery came to fool nearly everyone who examined it (ending up in Time magazine and dozens of other publications and scholarly websites) is a long and winding tale. Like many forgers, De Caro acted out of a mixture of greed, envy, and a desire to prove himself to a field he felt did not recognize his talents (De Caro also forged a copy of Galileo’s 1606 Compasso to replace a stolen version). A college dropout, he “held an imperious grudge against people who had spent years studying in libraries,” writes Schmidle. Instead, De Caro had earned an honorary professorship by donating four Galileo editions (presumably genuine) and a chunk of meteorite to a private institution in Buenos Aires. More than just a story of fraud and theft, De Caro’s is one of academic imposture. In 2006, for example, he participated in a panel discussion on Galileo at Fordham University, and despite the skepticism of actual scholars, his expertise was trusted in the rare books and museum worlds until his discovery. 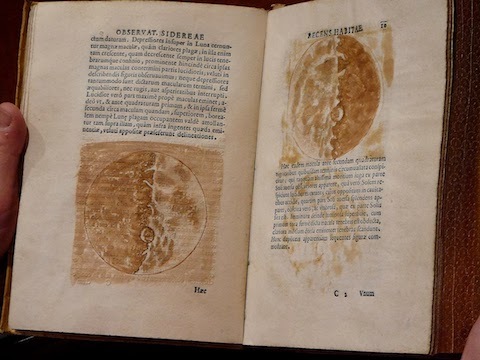 According to Schmidle, De Caro and an accomplice artist aged several bottles of nineteenth-century ink to create the Galileo drawings, using the Florence Sheet as a guide for the seventeenth-century astronomer’s hand. After opening a bottle of red wine, he had his accomplice trace the outline of the moons with the foot of his wineglass. Then they baked the pages in his home oven to age them. It’s hard to believe De Caro’s fake survived scrutiny for over five years, until Wilding began to express his doubts in 2011. Though facing several years in prison, De Caro hopes to work someday with the F.B.I., helping them discover forged and stolen books. He cites famous con man Frank Abagnale, played by Leonardo Di Caprio in the 2002 film Catch Me If You Can, as an inspiration. “I want to do for books what he did for checks,” says De Caro. “I can help them find all the black, offshore accounts of all the booksellers.” Read a facsimile of Schmidle’s article here. And for more on De Caro’s brazen crimes, see this detailed Examiner article. Sounds like another movie in the making; I would love to see the original works of Socrates. Re: Scale Lily – if you want “to see the original works of Socrates,” just write them yourselves. Re: Scale Lily – if you want “to see the original works of Socrates,” just write them yourself.